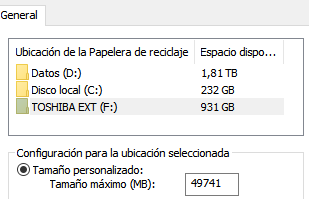 The question simple, but I don't know what to do, I have an external HDD (1TB) and this morning I have deleted a folder with 30GB of contents, but I forgot to empty the trash. Windows didn't empty the trash can because the limit is 19GB more than the data I have deleted. It's probable that the operating system does not recognize that the recycle bin folder on your hard drive (the folder where elements are moved when deleted) is not empty. You can try deleting the $RECYCLE.BIN folder in the root directory of your external hard drive. It is hidden and system so you first need to enable showing hidden and system files in the folder options (Folder Options->View->Advanced settings). If you're unable to delete the folder itself, try deleting its contents. Not the answer you're looking for? Browse other questions tagged windows hard-drive trash or ask your own question. How is free space reclaimed when files are deleted in Windows? HDD Space unlocked? Files deleted? How to move contents of a virtual disk image to another, bigger, virtual disk image? USB key with trash and invisible files into it : how?